Two of those companies, Boeing and SpaceX, have kept a relatively low profile in recent weeks. NASA announced last week a successful parachute test for SpaceX’s Dragon spacecraft that was an optional milestone for SpaceX’s CCiCap award, but otherwise the two companies have said little about their ongoing work or their CCtCap plans. The third company, Sierra Nevada Corporation (SNC), has been more active, however. Earlier this month, the company held a press conference in the Washington area to announce what it called the “international expansion” of its Dream Chaser space transportation system. That expansion consists of separate agreements with the European Space Agency (ESA) and the German space agency Deutsche Zentrum für Luft- und Raumfahrt (DLR) to study technologies those organizations could have that could be applied to Dream Chaser. These agreements are preliminary steps for potential future cooperation, the company said at the press conference. “The relationships right now essentially are frameworks for what might be future cooperation,” SNC corporate vice Mark Sirangelo said. “What we are structuring today is a long-term understanding of how we could work together; that is, the exploration of technologies, the exploration of missions, the exploration of how cooperation might help.” The agreements include no explicit exchange of funds between the agencies and SNC. There is a “basket” of technologies ESA and DLR have that could have a role in Dream Chaser. Sirangelo noted that Europe has considerable experience in lifting body designs and reentry systems that could be useful for Dream Chaser. ESA’s Elena Grifoni Winters said at the announcement that ESA could offer expertise on docking systems and crew displays. Johann-Dietrich Wörner, chairman of the executive board of DLR, said that they may also have materials that could be used in Dream Chaser design that are lighter than what SNC is currently using. While SNC is pursuing Dream Chaser to serve the International Space Station crew transportation market for NASA, Sirangelo said that they see Dream Chaser as a more “utilitarian” vehicle that can serve a range of applications. “What we’ve been doing, and actively working towards, is being able to understand and develop new customers and markets to that,” he said. SNC has a strong motivation to seek additional partnerships and customers. While Boeing and SpaceX received “full” CCiCap awards, valued at about $450 million each, SNC received an award about half that amount, which puts it at a potential disadvantage in the upcoming CCtCap competition. 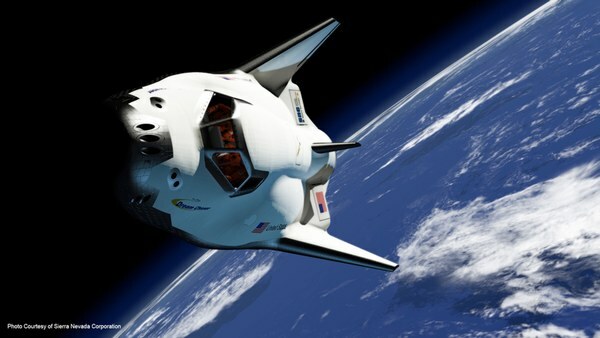 Sirangelo said SNC never intended to rely solely on NASA for Dream Chaser development or as a customer. “We have made our own major investment in the program,” he said of SNC. “We fully expect the program is going to continue, it’s now at a level of maturity where that’s possible” without NASA support. That could include closer ties with Europe in the future, even featuring the launch of Dream Chaser spacecraft on a Ariane 5. “It’s even possible, with somme minor changes to the Dream Chaser vehicle, to launch it in within the fairing” of an Ariane 5 ME version, Wörner said. SNC will continue its Dream Chaser promotional activity after today’s CCtCap deadline. On Thursday, SNC will announce “expansion plans” for its Dream Chaser program at the Kennedy Space Center at a briefing that features representatives of Space Florida, Lockheed Martin, and United Launch Alliance, as well as SNC and NASA. There had been speculation SNC would lease a Space Shuttle-era facility at KSC to support Dream Chaser work, although according to one local reporter, all three Orbiter Processing Facility hangars are already claimed by Boeing for its CST-100 commercial crew vehicle and X-37B military spaceplane. Jeff Foust | January 22, 2014, at 7:34 am | Category: Sierra Nevada Corp. It will be a bit sad if DC misses out. There’s something intuitively beautiful about a winged spaceplane and it’s certainly a different system to a capsule. If it was just technology developement then you could say that SpaceX has the edge on Boeing so pursue SpaceX capsule, DC spaceplane but who knows. I suspect it’ll be 2 capsules.